Treatment with this drug should be started or restarted in a hospital for proper monitoring. Too rapid correction of low levels of sodium in the blood may rarely result in a serious (rarely fatal) condition - osmotic demyelination syndrome (ODS). Tell your doctor right away if you notice any of the following symptoms of ODS: trouble speaking/swallowing, mental/mood changes (such as confusion), weakness/involuntary movement in the arms/legs, or seizures. This medication is used to treat low levels of salt (sodium) in the blood, which can result from conditions such as heart failure and certain hormone imbalances. Tolvaptan belongs to a class of drugs known as vasopressin receptor antagonists. It works by increasing the amount of urine you make, causing your body to get rid of extra water. This helps to slowly increase to normal levels of salt (sodium) in the blood. Read the Medication Guide provided by your pharmacist before you start using tolvaptan and each time you get a refill. If you have any questions, consult your doctor or pharmacist. Take this medication by mouth with or without food, usually once daily or as directed by your doctor. You should not take tolvaptan for longer than 30 days. To prevent losing too much body water (dehydration), have water available to drink at all times while taking tolvaptan. Drink when you are thirsty unless otherwise directed by your doctor. Use this medication regularly to get the most benefit from it. To help you remember, take it at the same time each day. Do not stop and restart this medication on your own. You may need to go back to a hospital to restart this medication. Tell your doctor right away if you stop taking this medication for any reason. What conditions does Samsca treat? Thirst, dry mouth, loss of appetite, constipation, or weakness may occur. If any of these effects persist or worsen, tell your doctor or pharmacist promptly. Loss of too much body water (dehydration) can occur. The risk is increased if you have persistent vomiting or diarrhea, and cannot drink normally. Contact your doctor right away if you notice any symptoms of dehydration, such as fast heartbeat or dizziness/lightheadedness. People with severe liver disease (cirrhosis) may have increased risk of bleeding from the stomach or intestines while taking this medication. Tell your doctor right away if you have any of the following symptoms: black/bloody stools, vomit that contains blood or looks like coffee grounds. Tolvaptan may rarely cause serious (possibly fatal) liver disease. Get medical help right away if you have any symptoms of liver damage, including: dark urine, persistent nausea/vomiting/loss of appetite, stomach/abdominal pain, yellowing eyes/skin. List Samsca side effects by likelihood and severity. Before taking tolvaptan, tell your doctor or pharmacist if you are allergic to it; or if you have any other allergies. This product may contain inactive ingredients, which can cause allergic reactions or other problems. Talk to your pharmacist for more details. Before using this medication, tell your doctor or pharmacist your medical history, especially of: diabetes, liver disease, inability to make urine (anuria), use/abuse of alcohol. This medication may rarely make your blood sugar rise, which can cause or worsen diabetes. If you have diabetes, check your blood sugar regularly as directed and share the results with your doctor. Your doctor may need to adjust your diabetes medication, exercise program, or diet. What should I know regarding pregnancy, nursing and administering Samsca to children or the elderly? A product that may interact with this drug is: desmopressin. Other medications can affect the removal of tolvaptan from your body, which may affect how tolvaptan works. Examples include azole antifungals (such as ketoconazole), cobicistat, HIV protease inhibitors (such as lopinavir, ritonavir), macrolide antibiotics (such as erythromycin), ribociclib, rifamycins (such as rifabutin), St. John's Wort, drugs used to treat seizures (such as phenytoin), among others. Does Samsca interact with other medications? Should I avoid certain foods while taking Samsca? Laboratory and/or medical tests (such as levels of sodium/potassium in the blood) should be performed periodically to monitor your progress or check for side effects. Consult your doctor for more details. Do not flush medications down the toilet or pour them into a drain unless instructed to do so. Properly discard this product when it is expired or no longer needed. Consult your pharmacist or local waste disposal company for more details about how to safely discard your medication.Information last revised March 2017. Copyright(c) 2017 First Databank, Inc. 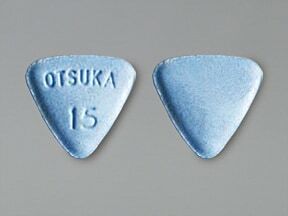 This medicine is a blue, triangular, tablet imprinted with "OTSUKA 15". 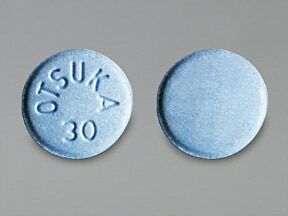 This medicine is a blue, round, tablet imprinted with "OTSUKA 30". Are you considering switching to Samsca? How long have you been taking Samsca?